The biggest purchase you’re likely to make in your lifetime is the purchase of your home. When looking for a home to buy, it becomes easy to get individual houses confused with one another. It’s difficult to keep up with all of the details. When it’s time to compare homes, oftentimes people try to do so from memory alone. 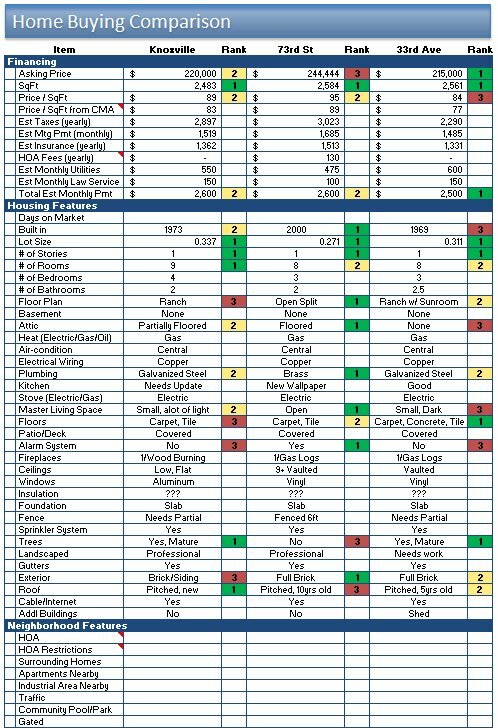 This home buying comparison checklist is a 2 page checklist that serves as an aid in simplifying this process. If you’re asking yourself, “What should I be looking for when buying a home?” – this checklist will certainly get ideas flowing. This home buying checklist will not solve all of your home buying problems, but hopefully, it will simplify the process and provide insight that would have otherwise been lost in the mix. You can modify the checklist before viewing a home so that the items critical to your home buying decision are included. Then use it to make notes while viewing. We’ve organized this checklist into logical categories: Financing, Housing Features, Neighborhood Features, Convenience to, and Schools. Remove all of the example data, this is just to give you an idea of how to use the list. Review the list to ensure it has the items specific to your needs. Once you have your top 3 homes selected, give each a label – in the example shown we use part of the street address. Begin filling out information while you visit each home; some of the information may take a little more research and will not be apparent as you tour the house. Take the time and do the research required (at least for items that are important to you). Remember, this home buying checklist will not solve all of your home buying problems, but hopefully, it will simplify the process and provide some insight that would have otherwise been lost in the mix. Automatically Alternate Row Coloring – the conditional formatting in the template adjusts the row coloring automatically. Learn how to automatically alternate row coloring in excel here. Looking for a feature that’s not there? Let us know.